Download "University of Pune. Rules for the Degree of Master of Philosophy (M.Phil.)" 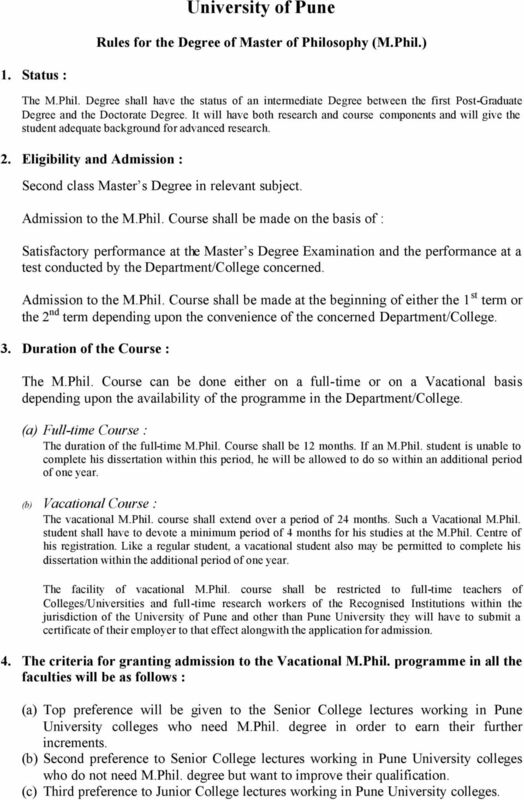 1 University of Pune Rules for the Degree of Master of Philosophy (M.Phil.) 1. Status : The M.Phil. Degree shall have the status of an intermediate Degree between the first Post-Graduate Degree and the Doctorate Degree. It will have both research and course components and will give the student adequate background for advanced research. 2. Eligibility and Admission : Second class Master s Degree in relevant subject. Admission to the M.Phil. Course shall be made on the basis of : Satisfactory performance at the Master s Degree Examination and the performance at a test conducted by the Department/College concerned. Admission to the M.Phil. Course shall be made at the beginning of either the 1 st term or the 2 nd term depending upon the convenience of the concerned Department/College. 3. Duration of the Course : The M.Phil. Course can be done either on a full-time or on a Vacational basis depending upon the availability of the programme in the Department/College. (a) Full-time Course : The duration of the full-time M.Phil. Course shall be months. If an M.Phil. student is unable to complete his dissertation within this period, he will be allowed to do so within an additional period of one year. (b) Vacational Course : The vacational M.Phil. course shall extend over a period of 2 months. Such a Vacational M.Phil. 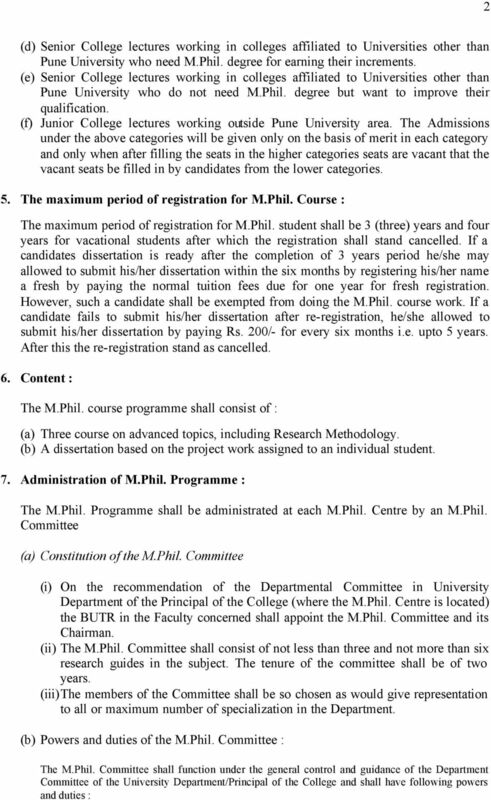 student shall have to devote a minimum period of months for his studies at the M.Phil. Centre of his registration. Like a regular student, a vacational student also may be permitted to complete his dissertation within the additional period of one year. The facility of vacational M.Phil. course shall be restricted to full-time teachers of Colleges/Universities and full-time research workers of the Recognised Institutions within the jurisdiction of the University of Pune and other than Pune University they will have to submit a certificate of their employer to that effect alongwith the application for admission.. 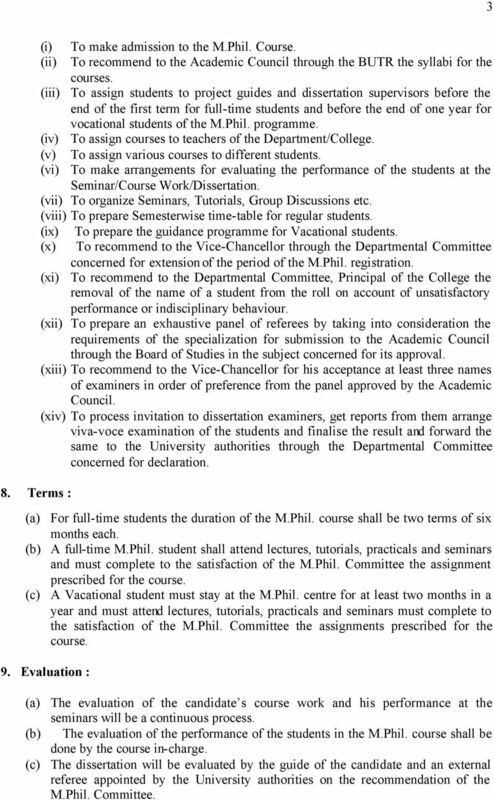 The criteria for granting admission to the Vacational M.Phil. programme in all the faculties will be as follows : (a) Top preference will be given to the Senior College lectures working in Pune University colleges who need M.Phil. degree in order to earn their further increments. (b) Second preference to Senior College lectures working in Pune University colleges who do not need M.Phil. degree but want to improve their qualification. (c) Third preference to Junior College lectures working in Pune University colleges. 3 3 (i) To make admission to the M.Phil. Course. (ii) To recommend to the Academic Council through the BUTR the syllabi for the courses. (iii) To assign students to project guides and dissertation supervisors before the end of the first term for full-time students and before the end of one year for vocational students of the M.Phil. programme. (iv) To assign courses to teachers of the Department/College. (v) To assign various courses to different students. 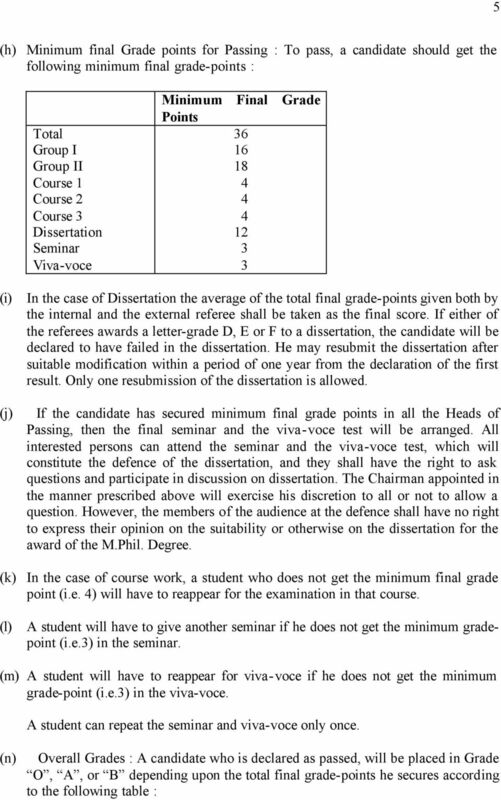 (vi) To make arrangements for evaluating the performance of the students at the Seminar/Course Work/Dissertation. (vii) To organize Seminars, Tutorials, Group Discussions etc. (viii) To prepare Semesterwise time-table for regular students. (ix) To prepare the guidance programme for Vacational students. (x) To recommend to the Vice-Chancellor through the Departmental Committee concerned for extension of the period of the M.Phil. registration. (xi) To recommend to the Departmental Committee, Principal of the College the removal of the name of a student from the roll on account of unsatisfactory performance or indisciplinary behaviour. (xii) To prepare an exhaustive panel of referees by taking into consideration the requirements of the specialization for submission to the Academic Council through the Board of Studies in the subject concerned for its approval. (xiii) To recommend to the Vice-Chancellor for his acceptance at least three names of examiners in order of preference from the panel approved by the Academic Council. (xiv) To process invitation to dissertation examiners, get reports from them arrange viva-voce examination of the students and finalise the result and forward the same to the University authorities through the Departmental Committee concerned for declaration. 8. Terms : (a) For full-time students the duration of the M.Phil. course shall be two terms of six months each. (b) A full-time M.Phil. student shall attend lectures, tutorials, practicals and seminars and must complete to the satisfaction of the M.Phil. Committee the assignment prescribed for the course. (c) A Vacational student must stay at the M.Phil. centre for at least two months in a year and must attend lectures, tutorials, practicals and seminars must complete to the satisfaction of the M.Phil. Committee the assignments prescribed for the course. 9. Evaluation : (a) The evaluation of the candidate s course work and his performance at the seminars will be a continuous process. 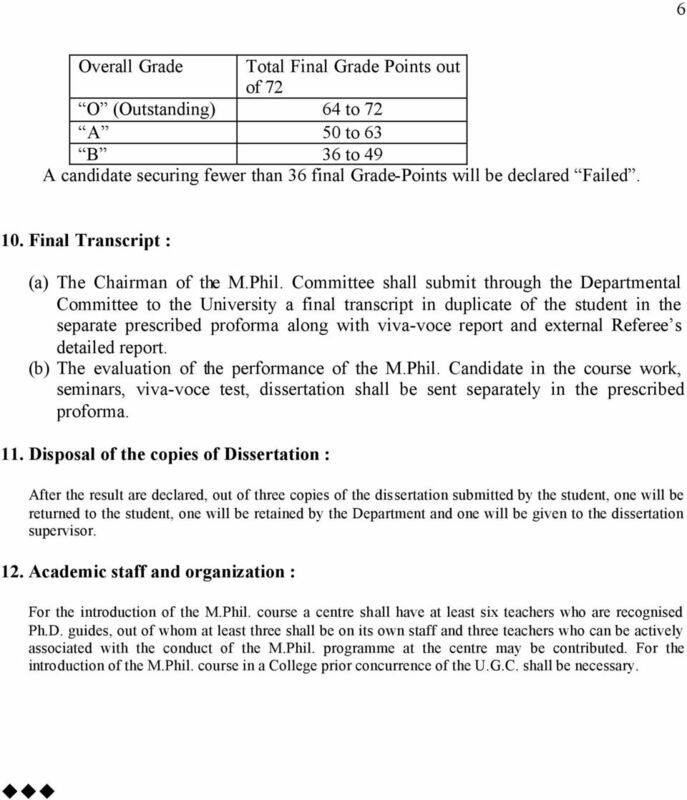 (b) The evaluation of the performance of the students in the M.Phil. course shall be done by the course in-charge. (c) The dissertation will be evaluated by the guide of the candidate and an external referee appointed by the University authorities on the recommendation of the M.Phil. Committee. 4 (d) The evaluation of the final seminar and the viva-voce test will be done by a committee consisting of the following : (i) A research guide to be nominated by the Head/Professor-in-charge of the University Department/Dean of the Faculty concerned from a panel of three senior research guides to be suggested by the dissertation Supervisor- Chairman. (ii) The dissertation supervisor. (iii) A number of the M.Phil. Committee to be appointed by the M.Phil. Committee (e) The evaluation of candidates for the M.Phil. degree shall be done according to the following grading system : Letter Grade Quality Grade Points Equivalent Numerical Scale (out of 100) O Outstanding A Very Good B Good C Average D Below Average E Poor F Fail The Examiners will award only the Letter Grades: (f) The performance of the candidates will be evaluated under the following Heads of Passing. The weightage given to each Head of Passing and the maximum final grade-points are as below : Head of Passing Group I Course 1 Course 2 Course 3 Group II Dissertation *Seminar Viva-Voce Weightage Factor Maximum Final Grade Points * Seminar and Viva-Voce will be based on the dissertation. (g) Evaluator of the various Heads of Passing will give letter-grades for each Head. The Grade-points corresponding to these letter-grades will be multiple by the weightage factor to obtain the total final grade-points for that Head. 6 6 Overall Grade Total Final Grade Points out of 72 O (Outstanding) 6 to 72 A 50 to 63 B 36 to 9 A candidate securing fewer than 36 final Grade-Points will be declared Failed. 10. Final Transcript : (a) The Chairman of the M.Phil. Committee shall submit through the Departmental Committee to the University a final transcript in duplicate of the student in the separate prescribed proforma along with viva-voce report and external Referee s detailed report. 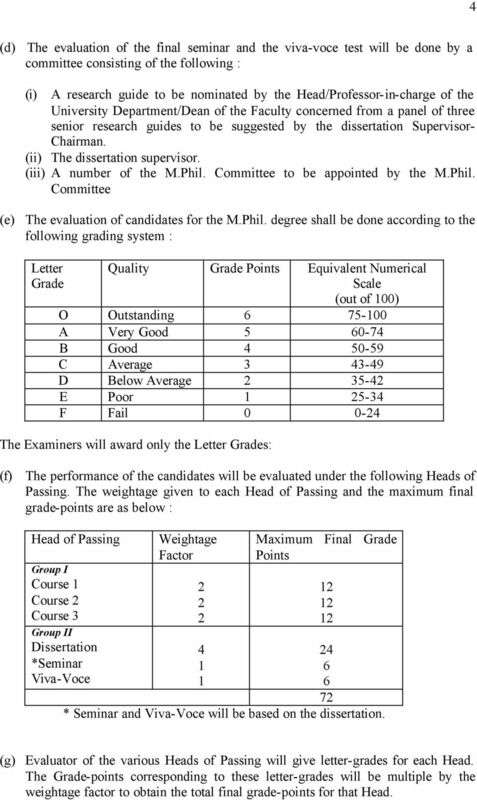 (b) The evaluation of the performance of the M.Phil. Candidate in the course work, seminars, viva-voce test, dissertation shall be sent separately in the prescribed proforma. 11. Disposal of the copies of Dissertation : After the result are declared, out of three copies of the dissertation submitted by the student, one will be returned to the student, one will be retained by the Department and one will be given to the dissertation supervisor.. Academic staff and organization : For the introduction of the M.Phil. course a centre shall have at least six teachers who are recognised Ph.D. guides, out of whom at least three shall be on its own staff and three teachers who can be actively associated with the conduct of the M.Phil. programme at the centre may be contributed. For the introduction of the M.Phil. course in a College prior concurrence of the U.G.C. shall be necessary. CENTRAL SECTOR SCHEME OF PROVIDING SCHOLARSHIPS TO STUDENTS WITH DISABILITIES TO PURSUE PROGRAMMES IN HIGHER EDUCATION SUCH AS M.PHIL. AND PH. UNIVERSITY OF PUNE Appendix A Application for Admission for the degree of Doctor of Philosophy (Ph.D.) (To be forwarded through the Head, Place of Research) 1. Faculty: 2. Subject : 3. Research Topic :..
Contd. 2 DIBRUGARH 786 004 ASSAM. (A) Points to be noted by the applicants. 1. The applicant must be a citizen of India. 2.0 Constitution of the Department Research Committee and Issues relating to Change of Title/Topic/ Supervisor(s) and Research. Regulations (2 of 2005) REGULATIONS FOR RESEARCH DEGREE PROGRAMMES: M.Phil, Ph.D. & POST-DOCTORAL PROGRAMMES (D.Litt, D.Sc. & LL.D.) AMITY UNIVERSITY UTTAR PRADESH GAUTAM BUDDHA NAGAR 0 CONTENTS Page No. Ph.D ORDINANCE Maharshi Dayanand University, Rohtak - 124001 Haryana, India www.mdurohtak.ac.in 1 ORDINANCES FOR REGISTRATION AND AWARD OF DEGREE OF DOCTOR OF PHILOSOPHY (Ph.D.) IN VARIOUS FACULTIES 1. Postgraduate Research Code of Practice APPENDIX 12 Revised 2014 This is the academic Framework for Professional Doctorate programmes to be delivered online in partnership with Laureate Online Education.